AssetLink Global LLC launched its Small Vessel Monitoring Solution (SVMS) to equip small-scale fishing vessels with satellite monitoring systems to track their location relative to fisheries and other boundaries and route distress calls. This system is designed to improve fisherman safety, enhance maritime security, and promote sustainable fisheries in the region. Affordable and easy to use, it enables the benefits of modern communications technology to reach smaller fishermen and their stakeholders. The Suriname Ministry of Agriculture, Animal Husbandry and Fisheries (LVV), Under Directorate of Fisheries has informed local fishermen about the new SVMS system, which will be placed on their boats. The system has undergone several years of testing through a trial program. There were many considerations for such an application – devices must be rugged and protected from impacts, and tampering. It also had to be easy to install, with no external cables, and most importantly, a continuous connection for vessel tracing and the ability to send distress calls. 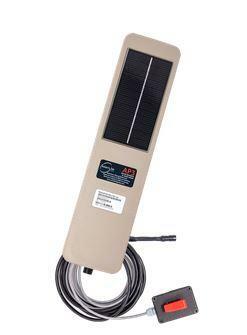 The AssetLink SVMS system consists of an environmentally sealed, solar-powered, two-way AssetPack satellite tracking device easily installed on any vessel with no external power cables. The device is housed in a marine-grade protective enclosure, with a tamper detection switch that alerts in case of removal. It also includes a marine-grade panic button in case of distress at sea. The AssetLink SVMS can be enhanced with external power connectivity, audible alarms and other sensors to comply with other regulatory mandates. “Using the AssetPack solar powered system has offered our clients a truly wireless solution with global coverage and many usages for safety, security and visibility of assets,” said Ryan Clarke, Owner and Director of Comprehensive Security Solutions, Inc. (CSS), the local VMS provider supporting the project. Operating on Iridium’s pole-to-pole satellite coverage means continuous connection, no service interruptions, and complete vessel traceability, even when far from shore or in remote coastal areas. The device features configurable reporting parameters, allowing the fisheries manager to customise the location transmit rate for each fishing vessel remotely, as well as an on-board geofence to immediately send a notification and alert when the vessel enters and exits specific zones. The on-board geofences can also be used to automatically change reporting configurations without the need for manual intervention. The AssetPack is configured out of the box to send reports from every few hours up to every 15 minutes (more if supplemental power is supplied) with location, time, speed, and heading. It has a simple on/off and mounting process and can be reconfigured over the air, allowing fisheries managers to simply install the device right out of the box. On shore at the control center, fisheries managers have complete fleet visibility, allowing them to comply with various regulatory requirements, develop sustainable fishing programs that ensure fishermen’s livelihoods, and aid in safety and rescue activities. “Complex VMS and AIS systems have existed for years, with numerous benefits for government and commercial organisations but few direct tangible benefits for smaller fishermen themselves. The technology costs of these systems have been out of reach for smaller vessels and countries that have the highest need. We are pleased to be able to bring our solution to this market and support a sustainable global fishing economy and, most importantly, support safety of human lives,” said David J. Goldstein, President & CEO of AssetLink Global. The devices are integrated with operations of the Sub-Directorate Fisheries Suriname, Coast Guard Suriname, and the local VMS provider Comprehensive Security Solutions (CSS), Inc. Fishermen are being trained on how they can handle the SVMS device. Contact us directly to find out how we can assist with your Maritime or Fleet Management project.